The last step is called “Just Do it!”. You have now completed all 5 steps of your analysis and have done the best possible analysis and preparation to identify a NEW CHANGE to solve your problem. But unless you actually implement it, you will never know if it would work or not. “F” is used when you want to stop multitasking to focus on a higher priority project. As the status changes, click on the new Status to show your progress to other stakeholders. 1. 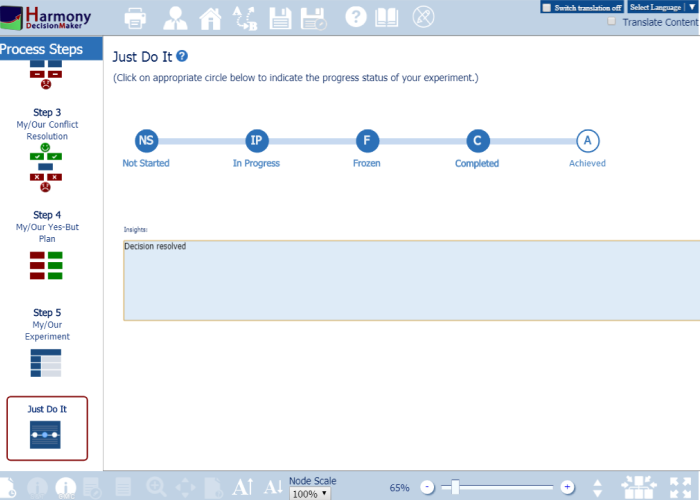 In this final step, you will monitor and report the project status of your experiment. Your project can be in one of 5 states: NS – Not Started, IP – In Progress, F – Frozen, C – Completed Implementing Change/Tactic, A – Achieved Objective/Strategy. "F" is used when you want to stop multitasking to focus on a higher priority project. 2 . As the status changes, click on the new "Status" to show your progress to other stakeholders.